1. On Saturday July 4th America celebrates her Independence. What is your favorite thing about the day? Your favorite food on the 4th? Do you fly a flag at your house? Fireworks-yay or nay? Any special plans this year? 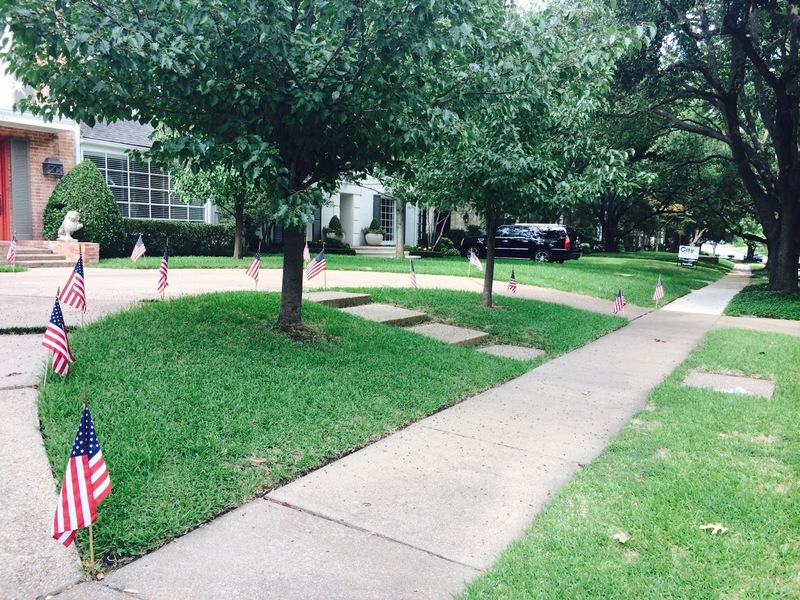 My house has been flag city since the weekend. My favorite memories were when I lived in DC and my friend Tim was always able to get us reserved seats for the A Capital Fourth show that takes place in front of the capitol every year and is televised on PBS. I still either watch it live or tape it every year. The fireworks are fantastic and it really makes you proud to be an American. Really, everything about Washington, D.C., makes me proud. It is such a wonderful, beautiful city. I've cried all over that town. This year, Joe and I are going to enjoy some music -- at the Dallas Wind Symphony concert. My mom and I always have a hot dog or two with chili and cheese with potato chips and I usually make Vincent's coleslaw to go with it. I also love watching the Will Smith movie Independence Day or just something on The History Channel. Fireworks -- YAY! The aforementioned concert tickets. Thanks, Jill! I haven't been to Rushmore, but would totally love to go. My favorite is the Lincoln Memorial in DC. I watch The Today Show almost every day, so I pretty much get my news from it. I also read The Dallas Morning News, but usually not the international/real news. Mostly read it for the style/entertainment section and local/metro. As for Isis, I wish we could all just get along. I almost always have vanilla in my freezer, but that is because I won't eat it in a single sitting. Chocolate is my favorite of the three. I have some chocolate Haagen Daz waiting for me right now. Coldplay's "A Sky Full of Stars" is amaze-balls. Check out this video -- if this doesn't get you moving, nothing will. And yes, Chris Martin is my boyfriend. Back off Gwyneth. I feel so lucky to have been born in America. I'm also extremely grateful to have such a wonderful family and ancestors who came to this country before it was America. God bless it. Good song choice. I love all the flags you placed outside. I may have to tape the fireworks on PBS this year. Happy 4th! What fantastic memories you have of the 4th in DC. I can imagine how electrifying it is. D.C. puts a lump in my throat too. The monuments and history that is. The politics cause a whole 'nother kind of angst : ) Enjoy your holiday weekend! Have fun at the concert, Happy Fourth of July! Would love to see Lincoln Memorial! I love the Coldplay song too! Have a happy 4th! Enjoyed your acrostic. I found the month of June quite friendly when it came to be able to read. We had lots of rainy days. Love the flags! Enjoyed reading your answers and listening to the song by Coldplay. Amen to your random!!! Thank you for visiting my blog and leaving a comment. I forgot that "Good Morning Star Shine" was from the musical "Hair." A lot of good music came from that musical. Have a safe and happy 4th.